The "right material" creates the necessary added value and provides benefits where it is urgently needed: in the daily work! The insulating anchoring is a fastening solution that has been developed for insulation systems with thermal insulation (insulation insulation) of 100mm insulation thickness. 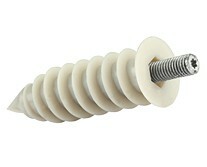 Insulation anchors are fitted with an M10 threaded connector and the fall pipes of the roof drainage are attached to these clips. The insulating anchoring has a drilling tip, which makes it possible to mount directly into the majority of the ETICS (heat insulation composite systems) after plastering without prior preliminary drilling. In WDVS made of hard foam boards, polystyrene boards, Styrofoam boards, Heraklithplatten as well as in wood fiber insulation boards (here however with pre-drilling 12mm) was successfully installed both before and after plastering. The M10 threaded connection is galvanized and thus offers long-term protection against corrosion. The insulating anchoring is also available with a yellow galvanized threaded connection M10 in order to mount downtube clamps made of copper. The threaded connection M10 is pre-assembled to guarantee a wall distance of the downpipe of at least 2cm as required by the regulations of the ZVDH (Zentralverband der Deutschen Dachdeckerhandwerk). The enclosed cover rosette guarantees a clean finish and is additionally equipped with a sealing disc, which is to protect against moisture. The cover rosette is made of UV-resistant plastic, which can be covered with almost all facade paints. Due to the M10 thread, the rosette can be installed properly. The insulating anchoring is supplied as a set for 5x insulating anchoring, 5x thread protector (preassembled), 5x cover rosette with pre-assembled sealing disc and a Torx bit TX25. There are customers who call the insulating anchoring also Isodbelübel, Iso dowels, insulating dowels, insulating dowels, thermal dowels or Thermodbelbel. Take a look at the product and assembly video and see for yourself the easy and fast processing.